We went to Vegas Valley Comic Book Fest! Quentin Quire is indisputably the Nancy of the X-Men. Iceman assures you that he is rad. We discussed X-Men #159–and a lot of other Dracula-relevant material–in Episode 18 – You’ve Got a Dracula Problem. 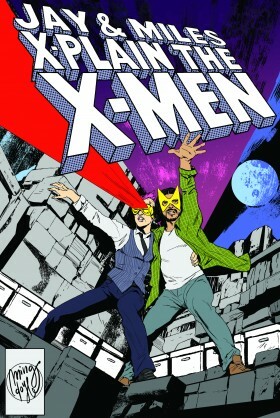 You can hear–and see!–us read the picture-book adaptation of “Days of Future Past” in the Jay & Miles Storytime Special. That said, we feel pretty strongly that this is a design that should be in everybody’s hands. You’re of course welcome to buy our merch above; but if you want to DIY your own, you can download a high-resolution stencil below. This stencil is free for use for any non-commercial projects. 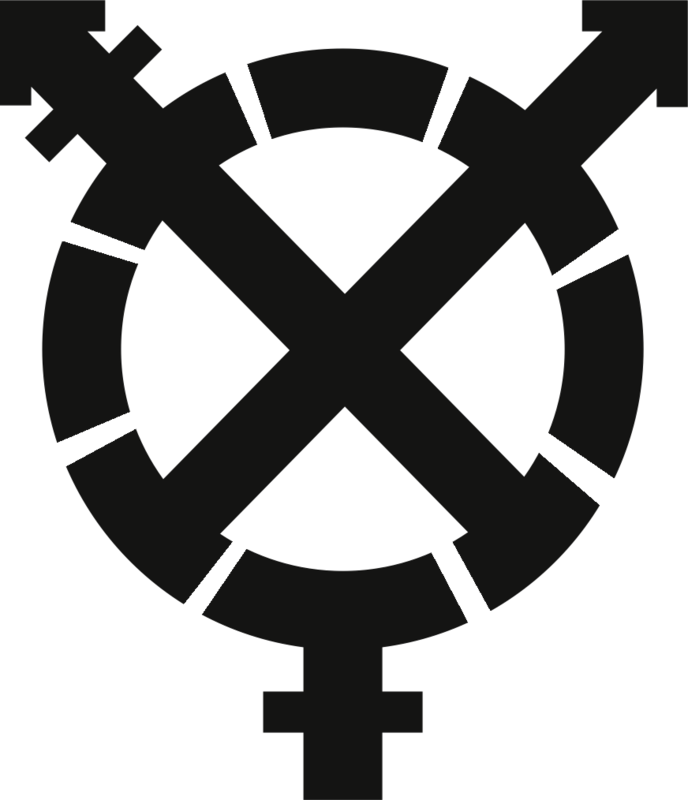 If your business is not trans-owned, any proceeds from merchandise you sell with this design should go to Trans Lifeline or another trans advocacy organization. Thanks to Dylan Meconis for design and file-formatting assistance! We’re juuuuust about recovered from Emerald City Comic Con (be sure to check out the live episode), and finally ready to show off our mountains of photos! First up: All the table sketches we remembered to photograph! Usually we only draw X-Men, but if you ask Jay to draw Lois Lane, he will draw Lois Lane. In which Jay makes a sartorial switch; Hope Summers is less confusing than you might expect; we are very happy to present our first all-artist convention special; Ramon kills his idols; Rachelle deciphers the past; Bret (re)defines New Mutants; a long-time mystery is resolved; colorists deserve more respect; the Xavier School probably has an actual curriculum; and a lot of X-Men have really cool hair. NEXT EPISODE: Cannonball dies (briefly)! No visual companion to this one, but check out the first part of our ECCC gallery over on our blog! Listen to the live episode here! We had our usual complement of word balloons, but we decided that the mutant revolution needed some additional signage. More signs! Jay has way too much fun with this stuff. Setting up the Days of Future Past wall at the Steep & Thorny Way to Heaven! Musical guest Kid Apocalypse was an awesome addition to the party lineup! The mutant revolution! Many thanks to everyone who turned out! In the same city for the first time in five months: THESE NERDS. And up bright and early the next morning for RCCC! Thanks again to Ma’at Crook for letting us borrow half her table! We did bad X-Men sketches again! Here’s Kitty Pryde, by Miles! …and the companion sketcy by Jay! Eye Boy was a collaboration and came out somewhat creepier than we were shooting for. The RCCC cosplay scene was awesome! Evolution Rogue! Cyclops stopped by for some revolutionary conspiracy! Logan and Laura were pretty much the default father/daughter costume this year. Not technically an X-character, but this Moon Girl was too awesome not to include in our roundup! We’ll let you guess whose hand this one is on. In which we have a whole, whole lot of feelings about Emma Frost; Old Man Logan goes back to the beginning; our hearts now and forever belong to All-New Wolverine; and we finally remember to do another mailbag segment! WHOA DANG ROSE CITY COMIC CON WAS SO GOOD! We met a zillion of you, and you were universally delightful! We did a ton of panels and threw a ridiculous party! And we shared a booth with the splendid Al Ewing, and he and Jay took advantage of the weird plethora of index cards we always bring to shows and spent their spare moments making minicomics, which we’ve collected here for your edutainment! Click through for road safety, karaoke, vacuum friendship, and more! NEXT EPISODE: The X-Men Anime.